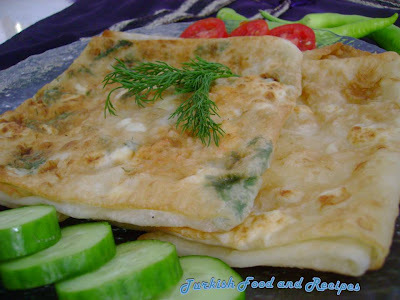 Gözleme is a savory traditional Turkish hand made and hand rolled pastry. Fresh pastry is rolled out, filled and sealed, then cooked over a griddle (sac). The name derives from the Turkish word “göz” meaning “eye”. It has several fillings such as; feta cheese, spinach- feta cheese, feta cheese-parsley, potatoes, minced meat and mushrooms. Mix the feta/ricotta/crumbling cheese and dill/parsley in a bowl. Add salt if the cheese is not salty also, sprinkle black pepper if desired. This filling will make 6 piece of Gozleme, so divide it into 6. Place the Turkish phyllo pastry on the counter or table and cut it from the middle to make two equal pieces. Then, sprinkle the filling all over. Fold the wide edges and close meeting each other. Fold the short edges and close the same way meeting the ends. You will form about a 6 inch length rectangle. Fold it in two. (Click to see the process) If desired you may spread butter between the layers. Use the same process for the remaining pastries. Use 1 tbsp of canola oil for every piece of Gozleme and fry the both sizes. Serve warm. 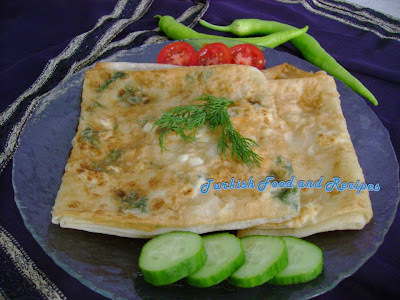 Gozlemes are good to go at breakfast, brunch or lunch. Peynir/lor ve dere otu/maydanozu bir kasede karistirin. Eger peynir tuzsuz ise tuz ve arzuya gore karabiber ilave edin. Bu malzemeden toplam 6 tane gozleme yapilacagi icin malzemeyi goz karari altiya bolun. Yufkayi tezgah ya da masanin uzerine yayin ve ortasindan keserek iki esit parca elde edin. Sonra, orta kisimlarina ic malzemeyi yayin. Once genis kenarlarini ust uste gelecek sekilde ortaya dogru kapatin. Ardindan kisa kenarlarini ortada bulusturarak ve yine hafif ust uste gelecek sekilde katlayin. Yaklasik 2 karis boyunda bir dikdortgen elde edin ve son olarak bunu da ikiye katlayin (yapilisini gormek icin tiklayin). Arzu ederseniz katlarken ara katlarina tereyagi surebilirsiniz. Geri kalan iki yufkaya da ayni islemi uygulayin. Kizartma tavasina her gozleme icin 1 yemek kasigi sivi yag koyarak gozlemelerin her iki tarafini da kizartin. Hayriye, Eline saglik, cok severim gozlemeyi, her cesidini. Sure you can try it with Fillo. It won't be the same but maybe a good alternative to make gozleme. Make sure using at least 2-3 pieces of fillo sheets together to obtain the similar thickness of yufka. I hope you'll enjoy the recipe. Good luck!